Samuel Beckett, for all the dour implications of his work, appreciated a good time. He loved comedians like Buster Keaton and the two principals of “Waiting for Godot,” Vladimir and Estragon, aren’t just a pair of schmos contemplating the meaningless or monotony of life, but cut-ups in the manner of Laurel and Hardy or Abbott and Costello. 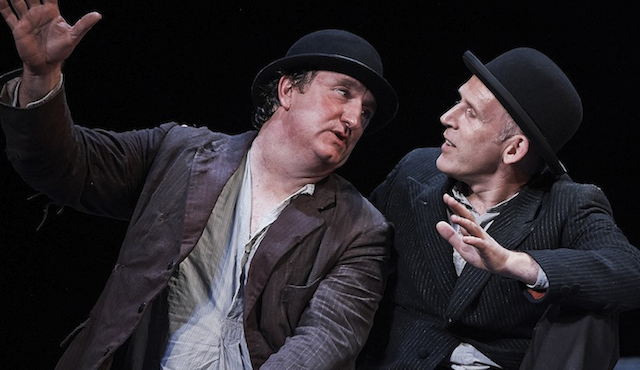 They’re the kind of comedic duos that come to mind watching Conor Lovett and Gary Lydon chew the lack of scenery in the excellent Gare St Lazare Players-Dublin Theatre Festival production, which was cocommissioned by ArtsEmerson and is now at the Paramount Mainstage (through Nov. 10). Beckett was very specific about how the play be presented and there’s only so much one can do with “A country road. A tree. Evening.” Director Judy Hearty Lovett and her designers and cast do quite a bit.